Start with placing your order by phone, fax or online. We will e-mail with the shipping cost before shipping your order. All orders ship to Canada via FedEx. Shipments through US Mail may be available. StoreSMART will clear the border with its own customs broker. Overnight Shipments — Although we can ship Fed Ex Overnight to Canada, we do not want you to be disappointed so please note that there is usually a 24-hour hold at the border. The order needs to be paid for with a MasterCard, Visa, or American Express credit card. It is payable in U.S. dollars only. We will fill out all the NAFTA customs forms needed to process the order. The order total DOES NOT include any taxes (PST, GST, etc.). You are responsible for paying all customs and duty fees. You will be charged these fees after FedEx has sent StoreSMART the monthly billing statement. There will be a 6% pass through fee for processing the transaction. 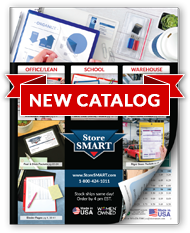 All Catalogs and Samples are sent by First Class Mail.